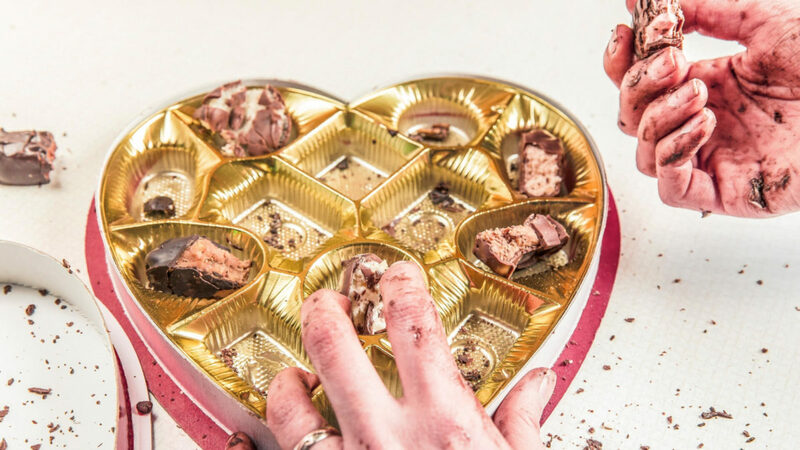 Eating Disorders and Food: Love or Lust? Do you remember the last piece of cake you had and the feeling associated with it? People obsess about food. They just do. The month of love is upon us and with it National Eating Disorders Awareness Week (February 25 – March 3). I don’t know about you but I find this to be kind of ironic, which is why I’m focusing on self-love and eating disorders in this month’s Eat for Life Academy webinar. On one hand, we are celebrating all things love, usually in the form of chocolate, champagne, pleasure, decadence, and enjoyment. On the other hand, we have eating disorders (ED’s) which are associated with fear, restriction, repulsion of self, and what I see as a lust for food. There is a difference between love and lust. Marriages that last are based on love. Marriages that fail are usually because of lust. I have had that lustful longing for food at times. But loving food is different. To cherish something requires patience and understanding, whereas longings (aka cravings) that go unrequited usually involve drastic measures (insert Lifetime stalker movie here). Such is the case with ED’s, which are a longing for perfection that can never be filled so the behavior required to reach said perfection becomes more and more drastic, which can be fatal. I know all about this longing because it consumed 25 years of my life in the form of non-purging bulimia (a form of bulimia that uses fasting and intense exercise instead of vomiting). Believe it or not, my issues with food began before grade school. I never fit in or felt good enough. I was a shy, insecure girl with glasses, hearing aids (I lost 50% of my hearing after a vaccine injury as a baby) and later, braces. I was so NOT cool. The popular kids bullied me incessantly and made of fun my differences. One time I got slapped across the face and lost one of my hearing aids in the playground sawdust (we had sawdust back then, LOL). Suffice it to say my parents were not happy. We didn’t have much money and my big, clunky, over-the-ear hearing aids were expensive. So, turning to food for comfort seemed completely logical in my little 9-year-old brain. It was a lust affair. If this wasn’t bad enough, a spark that was soon to turn into a very big flame was brewing inside me, something I wouldn’t know or understand until much later in my life. That is why I want everyone to take my free life assessment because there are so many things we can do to heal you from this trap! Eating disorders and nutrient deficiencies go hand in hand. Many people think nutrient deficiencies are caused by the eating disorder, especially in the case of anorexia and bulimia, but that’s actually not true. Like me, the women and young girls I work with have very strong genetic, epigenetic (how your genes perform over the course of your life), and environmental factors that all play a role in the development of anorexia, bulimia, and other forms of disordered eating such as Binge Eating disorder (BED) and orthorexia (an obsession with eating foods that one considers healthy). So buckle up for this next paragraph. I’m going to science the heck out of this. Anorexia is specifically correlated with severe zinc deficiency and undermethylation, which I’ve written two books about here. Zinc is required for a healthy appetite, taste and smell, which is absent in anorexia. When food doesn’t taste good and there is no desire for it, eating becomes pointless. This starvation dieting can develop into anorexia when nutrient levels hit the danger zone and begin to compromise normal cognitive functioning. It’s not surprising that we have such a large adolescent population with eating disorders because it’s during these years that zinc is vital for the growth, development, and the hormonal changes necessary to thrive. Binging and vomiting, two classic behaviors in many bulimics, trigger endorphins that release a feel-good sensation in the brain. This euphoric feeling is desired because they are fighting an underlying biochemical imbalance. Bulimics can have a wide range of combined biochemical imbalances. I often see overmethylation with low or high copper toxicity or undermethylation with copper and zinc imbalances. Another contributing factor is Pyrrole disorder, a stress disorder in which the body excretes large amounts of zinc and vitamin B6, nutrients that are critical for healthy neurotransmitter and cognitive function. Environmental triggers include societal views on beauty and the constant pressure to be perfect and flawless, worthy of the latest Instagram post, which is common in individuals that struggle with OCD and the constant drive for perfection. I know all about this because I was born with the condition known as undermethylation. This month I’ll be focusing on eating disorders in my Eat for Life Academy and I’d love to support you in learning how to eat for life, love your yourself, and finally be free! You can learn more about my EFL Academy here! Do you know someone who is struggling with an eating disorder and needs help loving themselves? Then be HOPE for them by sharing this post.